Looking for a great kid’s valentine card idea to send to grandparents or other loved ones? Try sending a long distance hug using your child’s handprints! 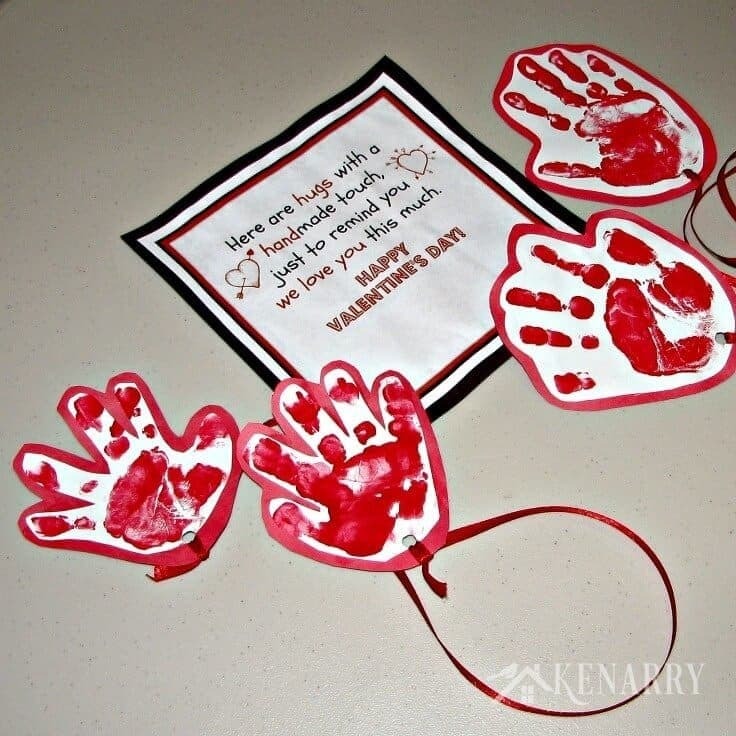 Send a long distance hug to grandparents using your child’s very own handprints! This kid’s valentine card idea will be a huge hit when your loved ones get it in the mail. This easy tutorial will show you how to make these cute cards. 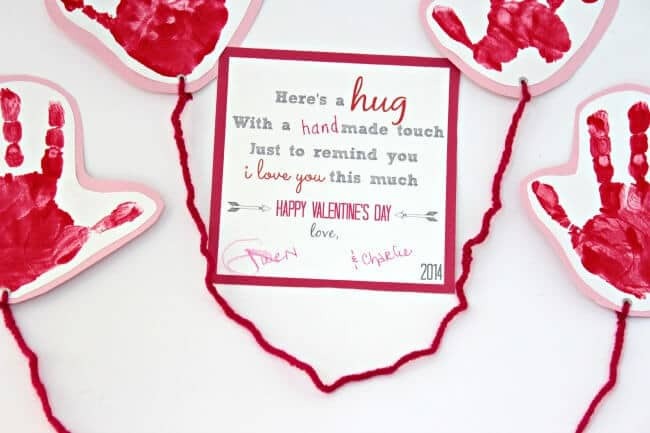 Wouldn’t they be surprised when they head out to their mailbox and discover these adorable handmade hugs from your children waiting for them on Valentine’s Day? You could even add chocolate kisses or hugs to turn it into a special Valentine care package. 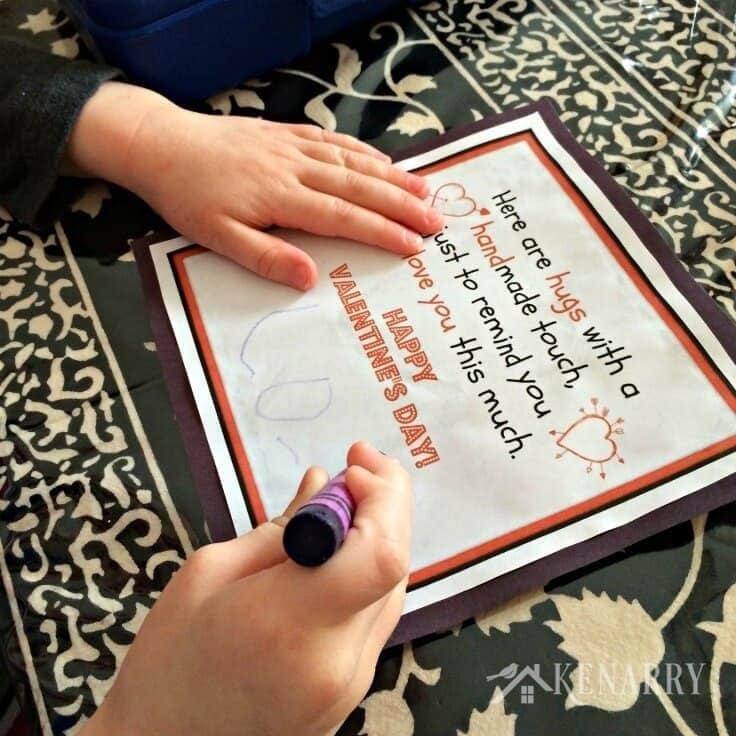 This kid’s valentine card idea is easy to create and is sure to delight grandmas, grandpas and other relatives near or far. Both my parents and parents-in-law live far away from us. We live in Michigan, but my husband’s parents are in Washington and mine spend the winter in Florida. I love to create fun art projects with our boys, so last year for Valentine’s Day we decided to make our own cards to mail to their grandparents. This kid’s valentine card idea was such a BIG hit with the grandparents that I got permission from Katie at View From the Fridge to share our version with you this year. In our version, I pluralized the text on the card, so I could send one valentine card with hugs from both boys. I also replaced the yarn with red ribbons since I had some left over from making C1’s Christmas Mug Teacher Gift. Pour a small amount of red paint on a disposable plate. Have your child carefully place his or her open hand into the paint until it’s covered. 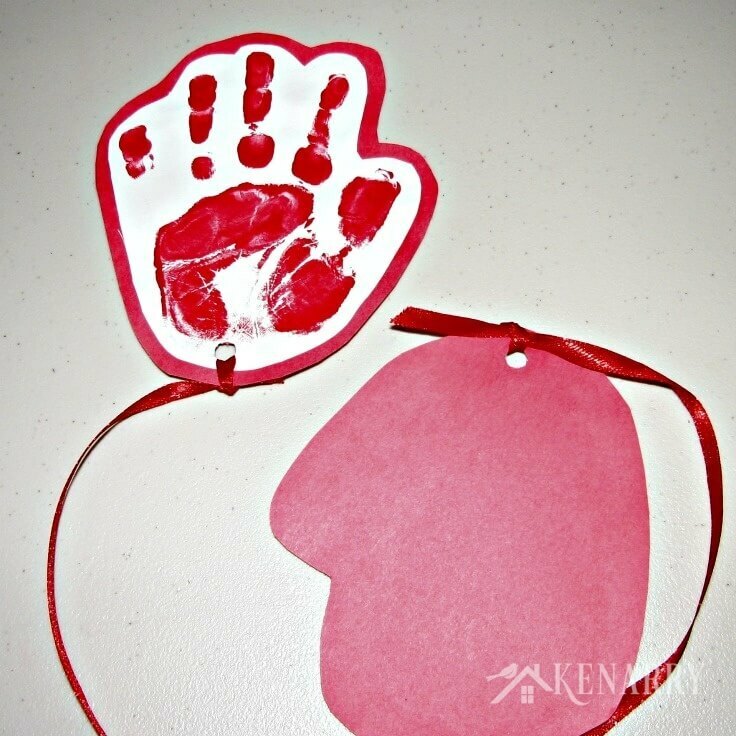 Then firmly press your kid’s hand on a piece of white cardstock. 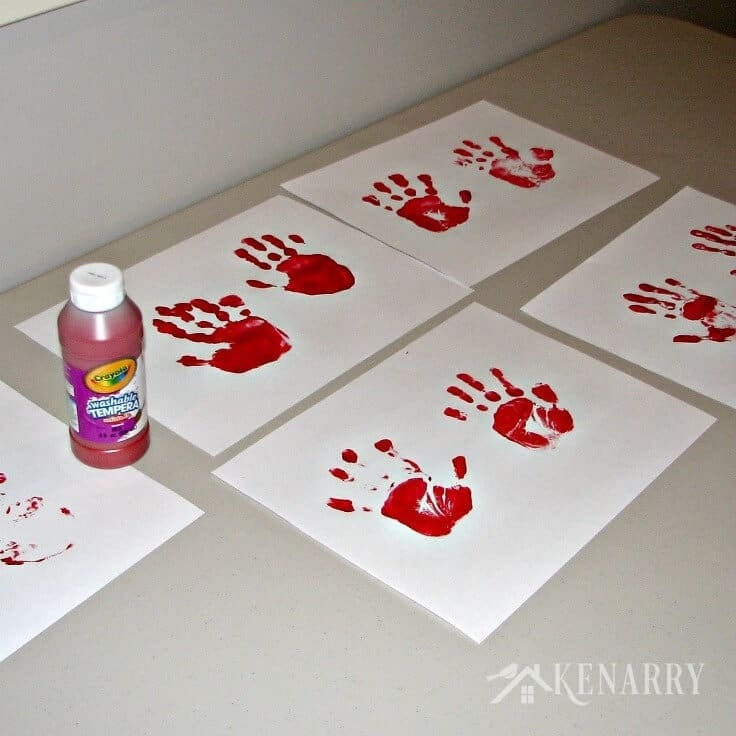 How to Minimize the Mess With Kids and Paint: You might notice in the photo, I had each of the boys use just one hand at a time in an attempt to minimize the mess. First I had C1 make several left handprints. Then I had him wash that hand before we created right handprints, so there was never a time when he had both hands simultaneously covered in paint. 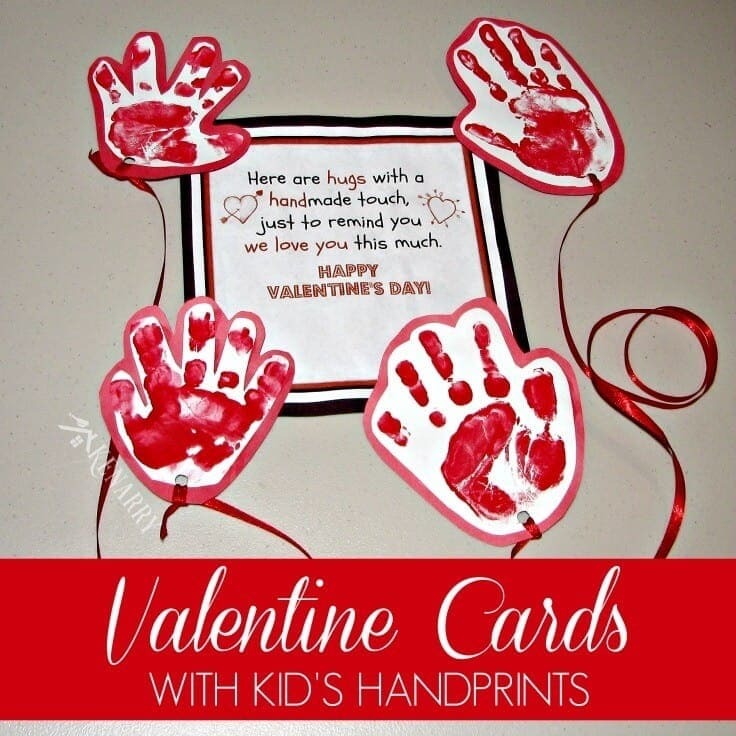 I also had the boys make more handprints than we really needed for this kid’s valentine card idea so I could choose the ones that turned out the best. I wasn’t nearly as successful with keeping C2’s hands out of the paint. In all fairness though, C2 was only one at the time and it was hard enough just getting him to keep his hand open to make the handprint. As soon as he had paint on the palm of his hand, he wanted to make it into a fist. I was just glad I stripped him down to only a diaper before we got started. 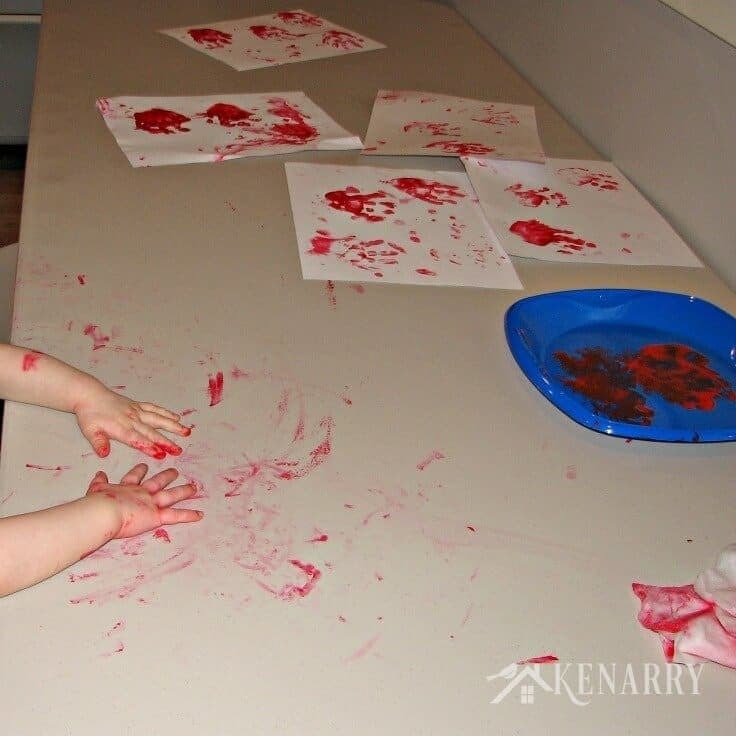 It looked like a Valentine’s Day massacre on the table when he was done painting. 2. Cut around the handprints. 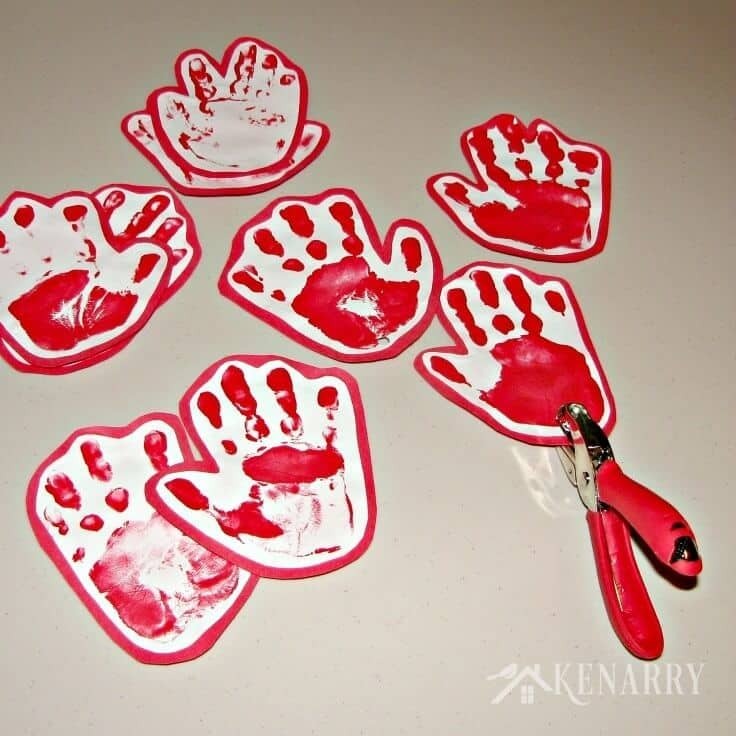 After the red paint has dried on the handprints, cut around the edge of the handprint. C1 was only 3 1/2 years old and just learning to use scissors at that time, so I did the cutting. If we were to make this kid’s valentine card idea again this year, I would let him try cutting around the hands himself. 3. 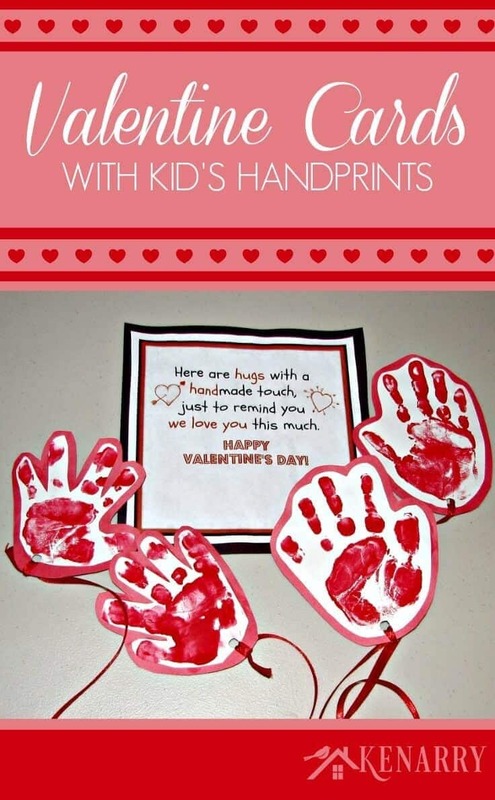 Mount the handprints on construction paper. 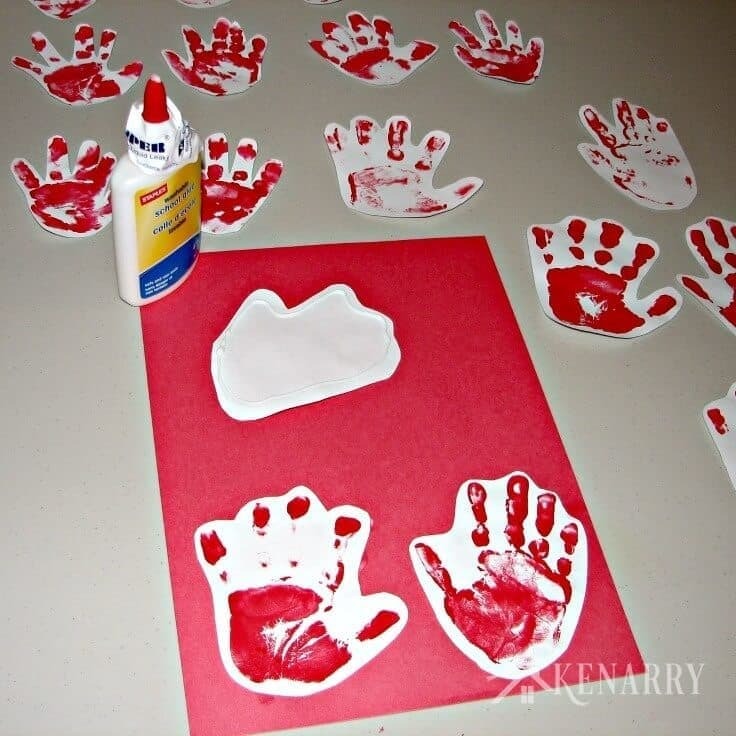 Glue the handprints to construction paper. Any color would work, but red and pink always seem the most appropriate for Valentine’s Day. I just used a little school glue and did it myself. 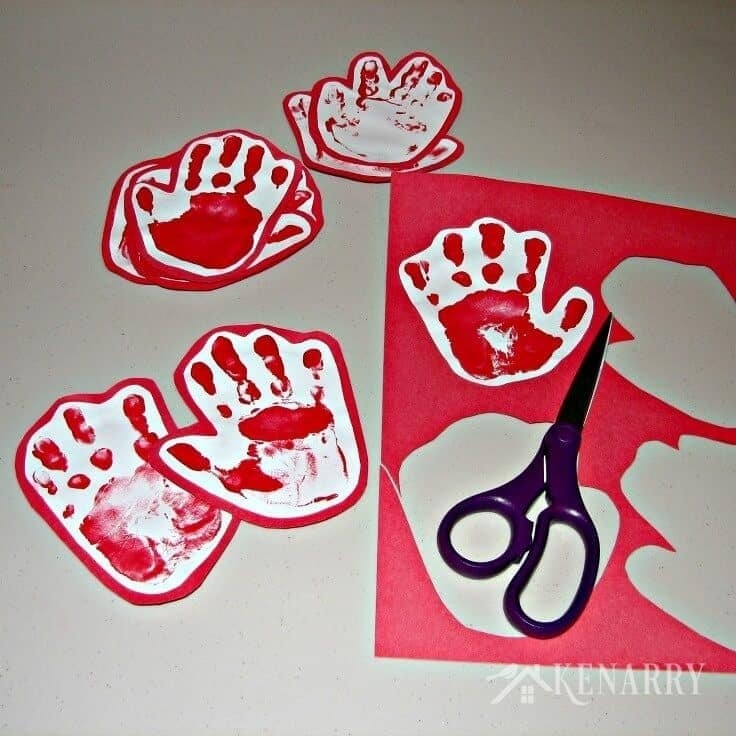 If you’d like to have your toddler or small child glue the handprints to construction paper, I recommend creating a glue sponge for crafting with kids. 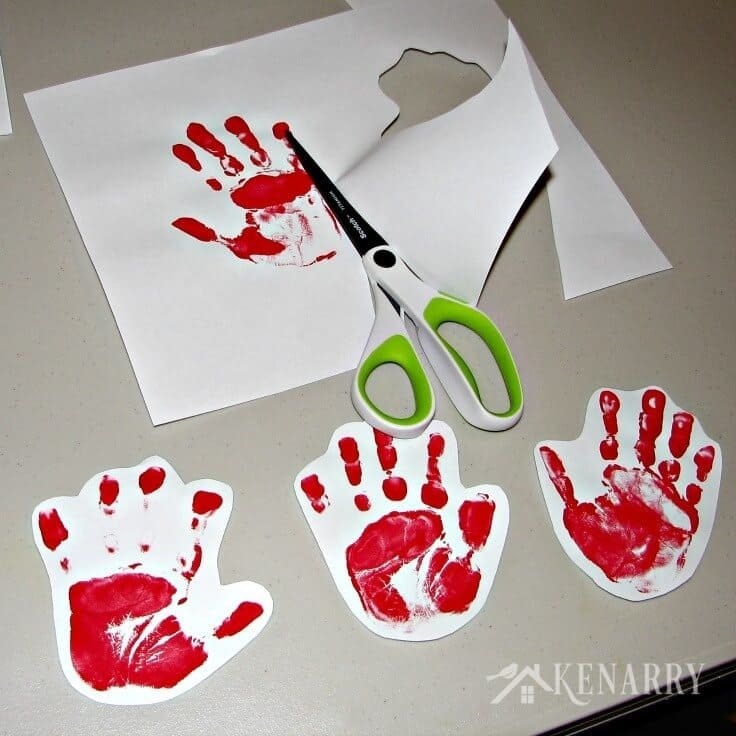 Cut around the handprints leaving a margin of 1/4 – 1/2 inch of construction paper showing. 4. Measure and cut the ribbon. 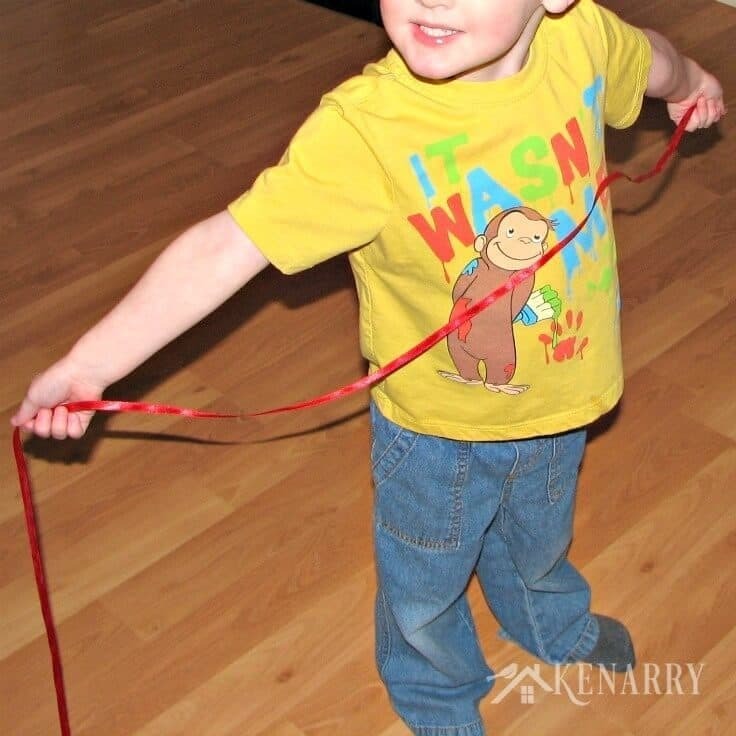 Have your child hold the end of the ribbon in one hand. Then stretch the ribbon across to the other hand to measure his or her entire arm span for the “hug”. Once you’ve cut the ribbon for one hug, you can use it to measure any remaining hugs you’re creating for this kid’s valentine card idea. If your child is as wiggly as mine, he or she won’t have the patience to measure out each and every hug. When we did this, it was also really fun to see how much shorter C2’s little hug was than his big brother’s hug. Punch a hole at the bottom center of each handprint. Tie the ends of the ribbon to the handprints. Make sure you get both a left hand and a right hand for each hug! 6. Get, print and sign the valentine poem. The printable Long Distance Hug Valentine Card is available as a FREE gift when you sign up below! Then you just need to download the PDF file and save it to your computer. The Long Distance Hug Poem and all other free printables from Ideas for the Home by Kenarry™ are for your own PERSONAL USE ONLY. Once you have the file, print the poem in color on white card stock, cut around it and have your child sign it. If you use regular computer paper, you may want to mount the poem on black construction paper to make it sturdier like we did. 7. Seal with a kiss and send. I wanted C1 to feel ownership over the creation of these valentines for his grandparents so I let him decorate the envelopes with stickers and a little crayon. I even made him trudge through the snow to the mailbox! This kid’s valentine card idea was a big hit with both sets of their grandparents. As soon as my parents got theirs, they had to show them to the boys on Skype. They each had the hugs draped around their necks like the boys were hugging them in person. I think my mother-in-law also hung the boys’ hugs and the poem on her refrigerator for several weeks. She eventually put them in her annual scrapbook along with a few pictures I sent her of the boys making them so she could save them forever. Your kid’s grandparents will be just as thrilled to get these long-distance hugs in the mail for Valentine’s Day. Enjoy! For more inspiration, follow our Valentine and Heart Ideas Board on Pinterest. This Inspired Idea for Long Distance Hugs for Valentine’s Day came from View From The Fridge and was shared with their permission. 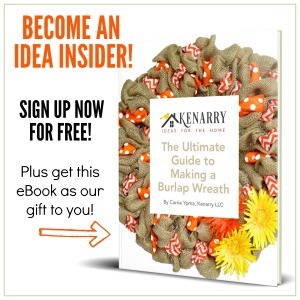 Inspired Ideas is a feature on Ideas for the Home by Kenarry™, sharing ideas we’ve found from Pinterest or other online resources. The words and photos used in this post are our own, derived from our personal experience implementing this idea. Originally published January 2015. Updated January 2019. The grandparents will LOVE them, Jessica! My parents just told me they put the hugs the boys sent them last year back out for display. I could hardly believe they still had them. Thanks, Joy! Your parents really would enjoy getting these in the mail. You ought to give it a try. Have a great weekend! These hugs, sent through the mail, are fantastic. I’m a huge fan of sending snail mail any time of year, and Valentine’s Day makes it easy to want to, I think. 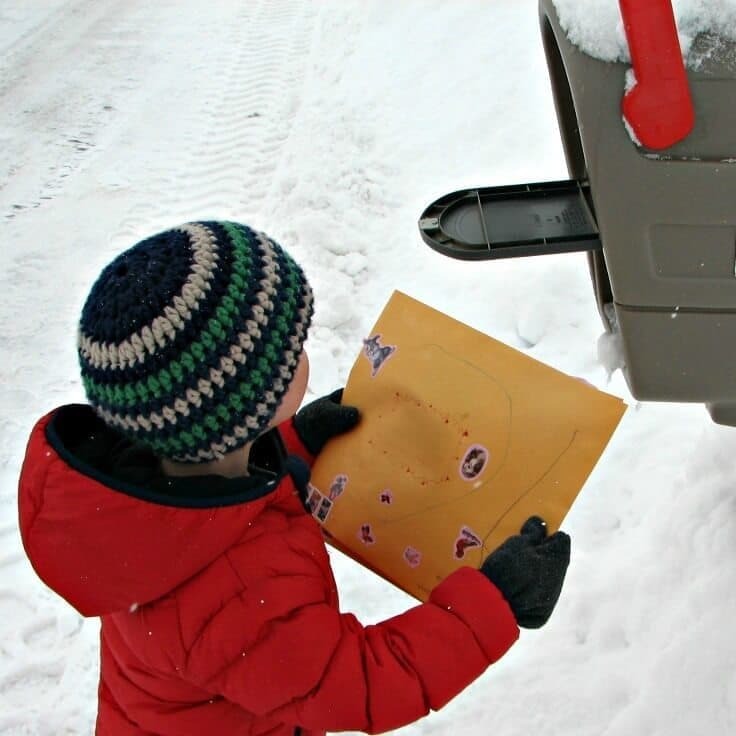 Great photo of your son with the envelope (love how he decorated that too) at the mailbox. Visiting you via #SITSShareFest p.s. wishing you lots of happy mail in return. A grandma has gotta love this!!! So cute!! Oh yes, both of the boys grandmas were thrilled to get these valentines. Thanks for swinging by to see us from Friday Features, Karren! Have a great week!